A record 15,000 people were at the tomb of the Biblical leader Joshua on Thursday night to mark the anniversary of his death. A record 15,000 people visited Joshua's Tomb on Thursday night to mark the anniversary of his passing. The Biblical leader Joshua was Moses' successor and led the Jewish people into the land of Israel upon their return from exile in Egypt. He is buried in Heres, in Samaria, a village dating back to Biblical times which is now a Palestinian Authority-controlled town. His tomb lies next to those of Nun, his father, and Calev ben Yefuneh, another Biblical leader from the same time period. Thursday night's visitors included Jews from across the religious spectrum, both men and women, of all ages, both Israelis and tourists. The event was the first to be made an official state celebration. 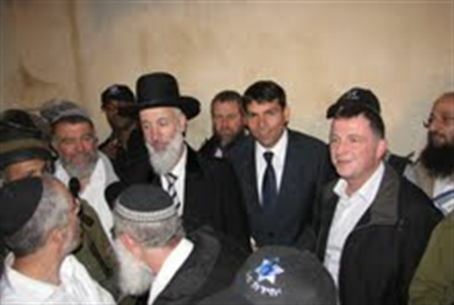 Chief Ashkenazi Rabbi Yona Metzger was present, as were Minister of Diaspora Affairs Yuli Edelstein and four Members of Knesset, Danny Danon (Likud), Uri Ariel (Ichud Leumi), Aryeh Eldad (Ichud Leumi) and Michael Ben-Ari (Ichud Leumi). It was organized by several groups, among them the Samaria Regional Council, Shechem Echad, the Samaria Religious Council, and Yesod Olam. Samaria Regional Council head Gershon Mesika called on Israel's current leaders to learn from Joshua son of Nun. Joshua provided an example of how to lead, “with faith, strength, and national honor,” he said. “When he had to conquer the land, he did not hesitate and think 'What will they say,'” Mesika added. Rabbi Metzger spoke of Joshua and Calev's greatness as the only two of the 12 spies sent to Israel by Moses who remained faithful to their task and confident in G-d's ability to bring them into the land. He also called on the government to provide more regular access to Joshua's Tomb and to Joseph's Tomb which, he noted, was supposed to be under Israeli control under the Oslo Accords.